East View Secondary students taking part in a pilot exercise yesterday, where they were taught safe cycling practices and the proper use of cycling infrastructure, among other things. 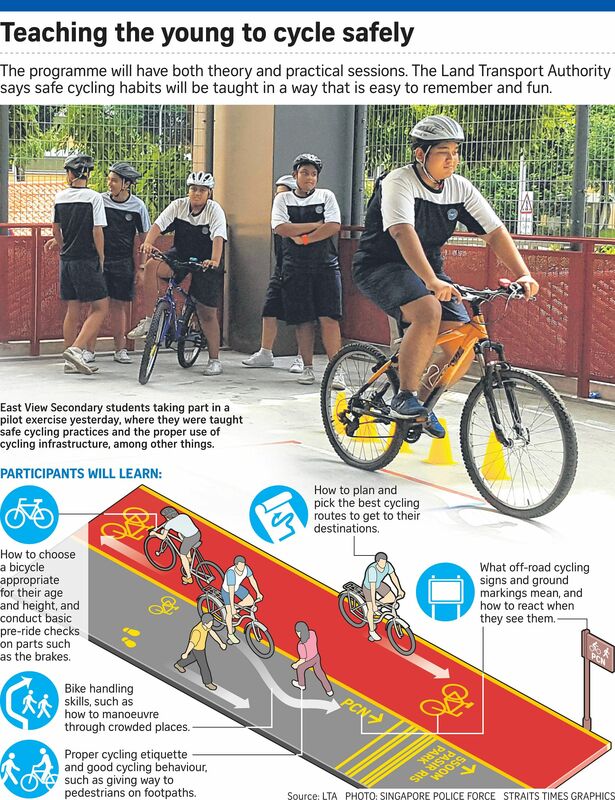 Students could soon be learning basic bicycle handling skills, cycling etiquette and how to recognise off-road signs and markings under a new programme that the Land Transport Authority (LTA) is rolling out in secondary schools. Launched yesterday at Qihua Primary School in tandem with the start of the Singapore Road Safety Month, the half-day Safe Cycling Programme will have both theory and practical sessions. Students will learn how to manoeuvre through crowded spaces, share paths with pedestrians and other cyclists, and pick the best routes to go by bike. The LTA said the programme will complement plans to boost active mobility here. Last month, the Government accepted a list of recommendations from an expert panel to allow cycling on footpaths. These are expected to be passed into law by the year end. Parliamentary Secretary for Education Faishal Ibrahim, who chaired the expert panel, said in a speech yesterday that the new programme was "a follow-up" to the recommendations. It will help students "internalise what they need to do in real-life situations", he said. Yesterday, East View Secondary School students took part in a pilot exercise, where they rode around a circuit within the Qihua Primary School compound before venturing out to Woodlands Park Connector. But the Ministry of Education stopped short of saying the programme would be made compulsory. Instead, it will encourage secondary schools to offer it as an enrichment programme for students who cycle. The programme will be piloted at foreign worker dormitories, schools and community centres, before it is rolled out to the public at the year end. Feedback from the pilot sessions will be used to fine-tune it. Dr Faishal said it is important that cyclists learn to share space with pedestrians. "We cannot always find space to build dedicated paths, and there will be occasions where cyclists have to share space with cars or pedestrians." One of the programme's trainers, Mr Steven Lim - who is president of the Safe Cycling Task Force - said it was important to start cycling education from a young age to minimise conflict when the new rules kick in. While the programme is currently on an opt-in basis for schools, experts such as Mr Lim believe it should be made compulsory. "Hopefully, it can become like swimming classes in schools... We want children to pick up something about safe cycling and for this to become like a life skill," he said. Secondary 2 student Javon Low, 13, took part in the pilot exercise and felt it was fun, safe and educational. "I learnt how to give way to pedestrians and how to signal to pedestrians before turning," he said. Yesterday, the Singapore Road Safety Council, along with Volvo Trucks, also launched the "Stop, Look, Wave" programme that hopes to get students to steer clear of the blind spots of heavy vehicles. The programme will be rolled out to other primary schools. Traffic Police statistics show that accidents involving heavy vehicles that result in injury or death are on the rise. There were 877 such accidents last year. In 2014, there were 839 accidents, and the figure was 816 in 2013. The data also show that 282 children were injured, and one child was killed in traffic accidents last year. Most of the accidents happened because either party failed to keep a lookout.